Balanced Customs: No overpowered items. We take care to balance our customs, be it monsters or gears. Super Stable: HeRO has been up for 9 years, with no wipes ever. Nice, active staff and support ticket system always available! Light vs Dark system: There is ongoing war and conflict between the followers of the light and the forces of darkness. The Light Allegiance is lead by Lady Thea, while the Dark Allegiance is lead by Sir Melot. You can swear your allegiance to either of them and by completing certain quests, you'll earn allegiance points and unique gears. Chronicles of Heroes: The server's storyline! Watch as it unfolds with you as the characters! Trial of Heroes: A monthly event where heroes gather to participate in a variety of trials: Monster Fighting, Item-Hunting, PVP, and Trivia. In the end, Light and Dark Allegiances clash in a mass battle. Those who obtain a certain score receive special rewards. Mission Board System: With this fully automated system, you can post the item you want and how much you're paying, and other players can hunt the item for you! Fishing System: By fishing, you can obtain bass, trout, salmon, etc, which heal HP/SP. Sometimes, you can even fish out other items. You You can earn points for fishing, as well as play a mini-game for items. Mining System: Mine for useful rocks and ores! You can obtain Oridecon, Elunium, and Lv 4 Weapon stones, among many others. You can earn points for mining, as well as play a mini-game for items. Nobility System: The Kingdom of Rune-Midgard is running low on funds, and King Ernst is willing to grant noble titles on heroes who bring him gold. Nobles are rewarded with a special mid-headgear gem that boost a stat of their choosing. They also receive monthly rewards from the King. Orphanage System: Create a baby class without the need to be adopted! Seasonal content: We have many custom seasonal quests and different looks for Prontera and other parts of Midgard, depending on the season. Custom Dungeons: We have various custom dungeons such as Thanatos' Basement, Fairy Paradise, Warzone and True Poring Island, among others! In addition, we have some renewal dungeons that are rebalanced to fit pre-renewal! Custom Monsters: HeRO is home to several unique monsters such as: Snow Bunny, Eralia, Autumn Leafcat, Selkie and Eye of Surtur. We also have many poring-types, like Sapling, Pandaring, Teddyring, Nekoring, Whispering and God Poring. In addition, we also have awesome custom MVPs, like Skoll, Surtur, Midnight Jack, Levia Lusca, Orcus, and many more! Custom Quests: There are countless quests to keep heroes busy and entertained. Sisterly Affection, Zodiac Gate, Wandering Spirit, Thanatos Party Quest, Guild Quest, Monthly Monster Extermination, Homunculus Quest and much more! Pets: HeRO has several custom pets, such as Teddy Bear, Siroma, Galapago, Aliot, Mavka, Violy. They drop their own tame and usually, their food as well. Light/Dark pets, such as Angeling, Deviling, Retribution and Observation, can be obtained via Allegiance Quests. Headgears: We have many custom headgears! 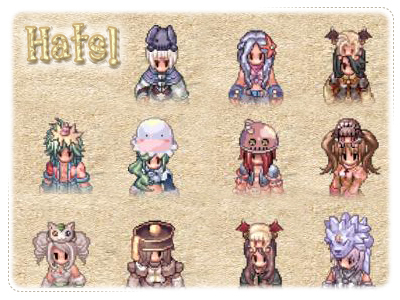 They can be obtained from monsters, quests, events, vote for points or Mr. Hatter! Donations: Our donations are balanced. No over-powered items are obtained through donation. They are mostly chance items or items already available in game (OPB, Hat Voucher, Rough Enriched Ore, Allegiance Token) or GM Services (which can also be voted for) used to change name, gender or transfer locked items. GM Hosted Events: GMs host many different events, such as Monster Invasion, Hide & Seek, Trivia, PVP for Items, Flower Maze, and many more! Automated Events: In addition to GM-hosted events, if you have an Event Bag, you can start an automated event and have fun! There's different events, such as Poring Smash, Fabre Tame, Zombie Run, etc. Community: HeRO has the nicest people around, always answering questions on #main chat and willing to help newcomers get started. What are you waiting for? Join us and become a hero! heRO is a friendly, sociable, unique and fun server of 5/5/3 rates with a great community, give it a try! Click here to find out more about heRO!